Equestrian Rubber Mulch & Shredded Playground Mulch | Rubber Safe Playgrounds Inc.
By now, you’re probably well aware of the many benefits of using rubber mulch on playgrounds. Rubber mulch offers more protection for kids and is a much better option than things like sand and wood chips. But do you know how rubber mulch is actually made? Keep reading to find out the process that plays out as rubber mulch is manufactured. Step one: old tires are gathered. Rubber mulch is made by recycling old rubber tires. From tiny tires from toys to gigantic tires from trucks, just about any kind of rubber tire can be used to make rubber mulch. It keeps tires out of landfills and gives them a second life as mulch. Step two: the steel bands are removed from them. Before rubber mulch manufacturers can turn old tires into mulch, they need to remove the steel bands that are located inside of them. These manufacturers often rely on magnet systems to make sure no steel is left behind in the tires. This makes the mulch as safe as it can be. Step three: the tires are shredded up and colored. Once the steel bands from tires have been removed, the tires are shredded up into tiny pieces of mulch. They’re also colored to give them a finished look. Black is the most common color used for rubber mulch, but manufacturers can make mulch almost any color they want. Step four: the rubber mulch is packaged. After the rubber mulch is all done being made, it’s packaged up into big bags so that it can be shipped out to those who want to use it. If you decide to incorporate rubber mulch into your playground, you’ll need to figure out exactly how much of it will be required before placing an order. 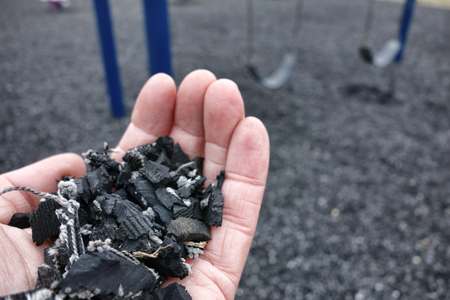 Do you want to get your hands on rubber mulch for a playground? Rubber Safe Playgrounds can provide you with as much of it as you need in whatever color you want. Call us at 630-330-6589 today to obtain a free quote.